Although most candy is not great for teeth and especially for kid’s teeth because they often lack the skills to keep their teeth clean; there are some times each year that eating candy is virtually inevitable. The fall weather is here and that means that the spooky decorations, costumes and Halloween candy are flowing. Kids get themselves ready and head out for door to door trick or treating. They load up a bag of candy only to get home to sit around and eat it. 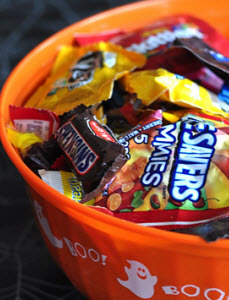 Limiting the amount of candy is a great way to prevent tooth troubles and choosing the right candy to eat is even better. You also want to be sure that your child knows how to care for their teeth such as proper brushing and flossing as well. Hard Candy is Bad for Teeth Enamel: One of the candies that is known to cause trouble for teeth in children are hard candies. They are a great option when people are looking for a treat to pass out. The problem is that the treats are hard and can be in all types of flavors and sizes. They can be attached to a stick like a lollipop of just wrapped singular by themselves. The problem that comes with hard candy is that kids will try and bite them and many times that will end up cracking, chipping and breaking their teeth. The other problem that occurs when the child is eating these hard candies is when they just keep them in their mouth for a long time. The sugar is then allowed to saturate the child’s mouth wearing away tooth enamel. Chewy Candy that Sticks to Teeth is Bad: A kid favorite just so happens to be treats that are sticky and chewy! They are one of the worst candies you can allow your kids during Halloween. The sticky candy starts to stick on the surfaces of the tooth as well as the cracks and other crevices. Even when you are done with the candy the small bits are still there and that can continue to eat away at your teeth. It also allows bacteria to fester in those same pockets that will potentially lead to decay. Teeth Sensitive After Eating Sour Candy: Another candy that is harmful to your teeth and the enamel are candies that are sour. It can be any kind of gummy or other candy that is covered with sour flavoring. The biggest problem is the flavoring is often full of acid which is bad for teeth. When your enamel is eaten away your teeth are more likely to have cavities. Best Candies for Teeth: If you have to pick a candy that is good for your child to eat or best to give out dark chocolate is a great option. The dark chocolate has less sugar than many other types of chocolate and the chocolate is much easier to wash off their teeth. You can also follow up with a candy bar that has lots of nuts in them. The nuts work to break up the sticky candy which is a great follow up treat if you eat the candy that is not great. No matter what candies you choose, it’s important to have regular check ups and exams. Smile Reef offers expert pediatric dental care including exams and treatment. Contact us to schedule an appointment today.